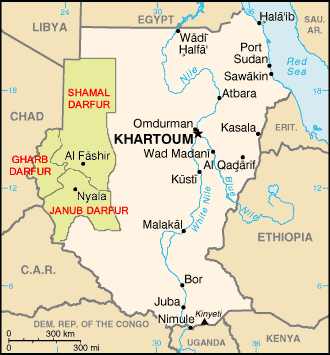 Darfur is a region of Sudan which borders the Central African Republic, Libya, and Chad along the Sudanese western border. It is divided into three federal states: Gharb Darfur (West Darfur), Janub Darfur (South Darfur), and Shamal Darfur (North Darfur). The region was devastated by drought in the 1980s, bringing to head ethnic conflict, which had been propagated by Muammar al-Qaddafi. His ideology had divided the population along artificial ethnic lines, identifying people as either "African" or "Arab." It continues to be a region suffering one of the worst humanitarian disasters in the world. The African Union, as well as international organizations, has been powerless in resolving the conflict. 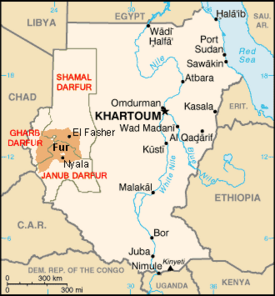 Darfur is an historical region in the westernmost portion of the present-day nation of Sudan. Slightly smaller than France, it has an estimated population of 7.4 million people. Darfur is, for the most part, an immense rolling plain some 170,000 square miles in area. These plains are relatively featureless and arid, particularly in the north, where they merge into the Libyan Desert. The plains are punctuated by occasional mountain ranges. The plateau is bordered by the Jebel Marra mountain range that defines the region along the north-south border. This range extends past the borders of Darfur, eventually reaching its highest point of between 5,000 to 6,000 feet. Towards the east, the range loses its sharp definition and dissolves into a series of sandy steppes. The Darfur region also contains a high level of volcanic activity, which has significantly aided in forming most of the mountain ranges in the area. One volcanic range, the Jebel Medob lies to the north east of Jebel Marra and is continuously affected by volcanic activity in the region. Volcanic activity in Darfur also results in volcanic craters, the most notable of which is Bir-el-Melh, a crater that descends 50 ft. into the ground. The rainy season in Darfur is from June to September, and it effectively transforms the dry arid plateau to a lush green that is rich with vegetation. The rains are a vital part of life in Darfur, helping the predominately agricultural society to grow a successful harvest of millet, which is the main crop of the region, and is used to feed both the human and livestock populations. Other main agricultural staples include cereals, fruit, and tobacco as well as livestock in the drier north. Despite the need for rain, the northern parts of the region sometimes go years without sufficient rainfall in contrast to the far south where the annual average rainfall is 700 mm. The Daju people were the first cultural group to establish a permanent presence in the inhospitable Darfur region. In order to survive in the arid climate, the Daju settled into the Marrah Mountain range. By living in the mountains, the Daju had steady access to water, necessary for the survival of any civilization. Despite the fact that the Daju created the first Darfuri civilization, little is known about the group. The only historical record of the civilization is a list of kings. In the fourteenth century, the Daju fell to a Tunjur invasion which significantly altered the political and religious structure of the region. In particular, the Tunjur invasion ushered in Islam and instituted Muslim political dominance in the region. The Tunjur also attempted to link their political system to the political history of the region by having their leader marry the daughter of the last Daju monarchy, thus adding legitimacy to their rule in the eyes of the Daju. The most notable leader in early Tunjun history is sultan Soleiman, who reigned from 1596 C.E. to 1637 C.E. He is considered the founder of the Keira dynasty, which led Darfur to become a formidable power in the Sahel. At the height of its expansion under the Keira dynasty, the Tunjun controlled an area reaching as far east as the Atbarah River. The power of the Tunjun began to decline in the end of the eighteenth century, marked by the military defeat of the sultan Mahommed Terab. Once a formidable military force, the armies of Tunjun were stopped at Omdurman and were unable to advance beyond the Nile. The inability to expand frustrated the expansionist tendencies of Terab, and he remained at Omduran for many months. He was poisoned by his wife at the instigation of disaffected chiefs, and the army returned to Darfur. During the mid-eighteenth century C.E. the many cultural and ethnic factions within Darfur proved to have conflicting goals. Divisions among groups were catastrophic for Darfur, leaving the region unable to survive external wars with the Sennar and the Wadai. The final blow for the weakened, independent Darfur took the form of an Egyptian invasion in 1875. Egypt was itself a colony under Great Britain, and perpetrated colonialism by setting up an Egyptian settlement in Khartoum. Egyptian rule did not last long in Darfur, and Muhammad Ahmad soon rose to power as the leader of the region. His authority, however, was largely self proclaimed and not widely accepted. Muhammad Ahmad was succeeded to the throne by Adballahi ibn Muhammed, whose reign proved even more contentious among the population. He demanded that the pastoralist tribes under his control provide soldiers so that the royal court could further pursue an expansionist policy. The recruitment policy proved to be his downfall, and many tribes rose up in rebellion. The British government revitalized their presence in Darfur in response to the widespread dissent in the region. British forces succeeded in overthrowing Adballahi in 1898 C.E., and instituted Ali Dinar as the British supported leader of Darfur. During World War I, Great Britain began to fear that Darfur could fall under the control of Turkey, and incorporated the area into Sudan in 1916. By 1956, the area was racked by political instability. Adding to the military threat from continual wars between Sudan, Libya, and Chad, a new ideology propagated by Libyan president Muammar al-Qaddafi began to take hold in Darfur. This new ideology divided the population along artificial ethnic lines, identifying people as either "African" or "Arab." Ethnic conflict reached its height when a 1980s drought disrupted the existing social structures in the area. The 1980s brought about the first fighting in the area, a conflict which would continue in some degree for the next 15 years. Fighting reached its peak in 2003, when the Darfur Conflict devastated the country. The conflict soon came to be regarded as one of the worst humanitarian disasters in the world. 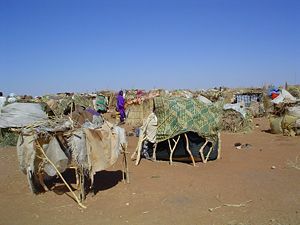 An internally displaced persons camp in Darfur. Darfur children in an IDP camp. The Darfur Conflict is a complex crisis in the Darfur region of western Sudan. One side of the armed conflict is composed mainly of the Sudanese military and the Janjaweed, a militia group recruited mostly from the Arab Baggara tribes of the northern Rizeigat, camel-herding nomads. The other side comprises a variety of rebel groups, notably the Sudan Liberation Movement and the Justice and Equality Movement, recruited primarily from the land-tilling Fur, Zaghawa, and Massaleit ethnic groups. The Sudanese government, while publicly denying that it supports the Janjaweed, has provided money and assistance to the militia and has participated in joint attacks targeting the tribes from which the rebels draw support. The conflict began in February 2003. 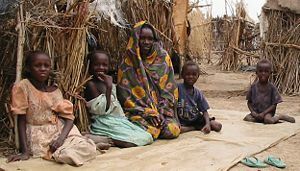 Unlike in the Second Sudanese Civil War, which was fought between the primarily Muslim north and Christian and Animist south, almost all of the combatants and victims in Darfur are Muslim. The government and Janjaweed attacks upon the non-Baggara civilian populace have resulted in a major humanitarian crisis. There are many casualty estimates, most concurring on a range within the hundreds of thousands. The United Nations estimates that the conflict has left as many as 450,000 dead from violence and disease. Most NGOs (non-governmental organizations) use 200,000 to over 400,000, a figure from the Coalition for International Justice that has since been cited by the UN Sudan's government claims that over 9,000 people have been killed, although this figure is seen as counter-factual. As many as 2.5 million are thought to have been displaced as of October 2006. The Sudanese government suppressed information by jailing and killing witnesses since 2004, and tampering with evidence such as mass graves and eliminating their forensic values. In addition, by obstructing and arresting journalists, the Sudanese government has been able to obscure much of what has occurred. The mass media once described the conflict as both "ethnic cleansing" and "genocide," and now do so without hesitation. The United States government has described it as genocide, although the UN has declined to do so. In March 2007, the UN mission accused Sudan's government of orchestrating and taking part in "gross violations" in Darfur and called for urgent international action to protect civilians there. After fighting worsened in July and August, on August 31, 2006, the United Nations Security Council approved Resolution 1706, which called for a new 17,300-troop UN peacekeeping force to supplant or supplement a poorly funded, ill-equipped 7,000-troop African Union Mission in Sudan peacekeeping force. Sudan strongly objected to the resolution and said that it would see the UN forces in the region as foreign invaders. The next day, the Sudanese military launched a major offensive in the region. In the meantime, the conflict expanded into part of the broader Central African War. The Darfur region is culturally divided along occupational lines, with the agricultural Fur people in the center, the former ruling class Tunjur in the north, and Nilo-Saharan–language–speakers in the northwest who focus on animal husbandry as livelihood. The largest cultural groups in the northwest are the Berti people and the Zaghawa people. In the western portion of the Darfur region, the Masalit people have successfully maintained their cultural identity and remained independent from Dar Fur. In the early history of the region, a group of Arab camel herders traveled to the southern parts of the area in search of an adequate source of rainfall. This group of people later merged with the Fulani people and became known as the Baggara. Soon after the populations blended to form one cultural unit, the Baggara switched from raising cattle to raising horses. The Baggara developed a duel society, where portions of families were left in the south to cultivate the agricultural fields while a portion of the family took herds to established–grazing–areas. Arabic, predominately found south of Nyala and in the eastern portions of Darfur, but smaller enclaves of Arabic speakers are also found along the Chad border in a narrow strip north of Jebel Si, between Fur and Zaghawa. Daju, is only found in a small pocket near Nyala. It is an offshoot of the Western branch of the Eastern Sudanic group of the Nilo-Saharan language family. Erenga, considered a dialect of Tama, is found north of Geneina and across the border in Chad. Fongoro, is considered almost extinct as most speakers of the language have shifted to speaking Fur, the remaining speakers are found south of Sinyar. Fulbe, or Fulfulde, is only found in a small area south of Nyala. Fur, is located in the center of the region, reaching from Wadi Azum in the west to Al Fashir in the east. It belongs to the Fur language group of Nilo-Saharanlanguage family. Masalit, is located mostly west of Wadi Azum and around Geneina; it is also spoken across the border, and in a small isolated area south of Nyala. It belongs to the Maban language group of Nilo-Saharan family. Sinyar, is mostly found along the border south of Masalit. It is closely related to Fongoro. Tama, is only found in a small Tama speaking pocket between Jebel Si and Jebel Marra. It is closely related to Daju. Zaghawa, is popular in the northern portions of Darfur. ↑ Alex de Waal, Famine that Kills: Darfur, Sudan (Oxford University Press, 2005, ISBN 0-19-518163-8), p. 36. ↑ Genocide Watch, Rights Group Says Sudan's Government Aided Militias. Retrieved July 25, 2007. ↑ Kasie Hunt, Celebrities, activists rally against Darfur genocide, USA Today. Retrieved July 28, 2007. ↑ Washington Post Online, Hundreds Killed in Attacks in Eastern Chad. Retrieved July 28, 2007. ↑ David Gollust, US Angry Over Sudan Leader's Denial of Role in Darfur Atrocities, Voice Of America. Retrieved July 28, 2007. ↑ Alfred de Montesquiou, African Union Force Ineffective, Complain Refugees in Darfur, The Washington Post. Retrieved July 28, 2007. ↑ The Australian, The horrors of Darfur's ground zero. Retrieved July 28, 2007. ↑ Research, Development, and Statistics, Country Of Origin Report: Sudan. Retrieved July 28, 2007. ↑ Andrew S. Natsios, Darfur: A "Plan B" to Stop Genocide? US Department of State. Retrieved July 28, 2007. BBC News Online. May 29, 2007. Sudan's Darfur conflict. Retrieved July 18, 2007. Brooks, George E. 2003. Eurafricans in Western Africa: Commerce, Social Status, Gender, and Religious Observance from the Sixteenth to the Eighteenth Century. Athens: Ohio University Press. ISBN 0821414852. Darfur Information Center. Darfur Information. Retrieved July 18, 2007. Davidson, Basil. 1998. West Africa Before the Colonial Era: A History to 1850. London: Longman. ISBN 0582318521. Encyclopædia Britannica. 2007. Darfur. Encyclopædia Britannica Online. Retrieved July 27, 2007. Lewis, Brenda Ralph. 2002. Great Civilizations. Bath: Parragon. ISBN 0752561413. Human Rights Watch. Darfur Destroyed. This page was last modified on 14 November 2017, at 17:33.